Over the years a bunch of Cydia Tweaks have been released to customize the notification center ever since Cydia began. In iOS 7, the default notification center is vague and has much fewer functions than the previous iOS versions. In order to overcome this barrier, hackers have been continuously producing jailbreak tweaks for a long time. Some of our favorite NC tweaks haven’t yet been updated to work for iOS 7.1.x like “Favorite Contacts 7 for Notification Center“. At least some of them are not working properly when installed on these devices. Here we have mentioned some of the best free notification center tweaks that are working on iOS 7. 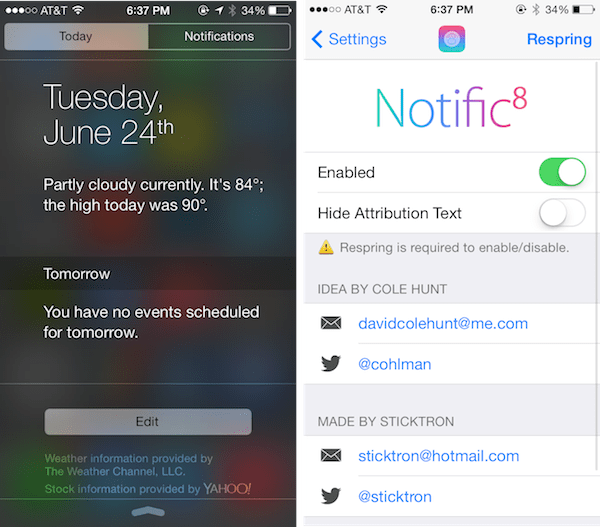 Among them, there is a new free cydia tweak that came very recently called Notific8 that makes your Notification Center look exactly like the one in iOS 8. 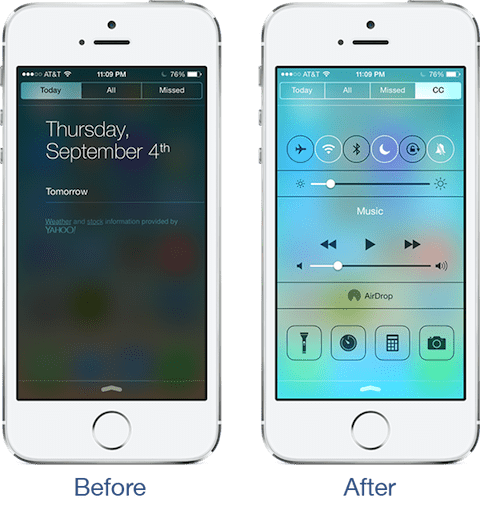 In addition, we made out a comprehensive list of the Best Free Cydia Tweaks for Notification Center iOS 7, iOS 7.1, iOS 7.1.1 , iOS 7.1.2 with descriptions of each tweak in detail. They are all a must have if you are looking to customize your notification center and carry out your phone functions quickly and effectively. The best advantage a Notification Center tweak may offer is that you can open new apps/dial contacts/browse notifications without having to close down the currently open Apps. Most of the tweaks mentioned here are compatible with iPhone 4, iPhone 4s, iPhone 5, iPhone 5s, iPad mini, iPad Air, iPod etc. It is a brand new cydia tweak that enables you to take quick notes on the go directly from the Notification Center without closing or opening any other App you are using. It has some quick functions such as copy, paste and replace. You can also change the background color and text color and adjust transparency from the Settings app. The text can be fully scrolled and has a font size selection from 9 to 36 points. You can also hide the keyboard by tapping on the right side of the screen. This is a quick note tweak for N.C. and comes with minimum customization. 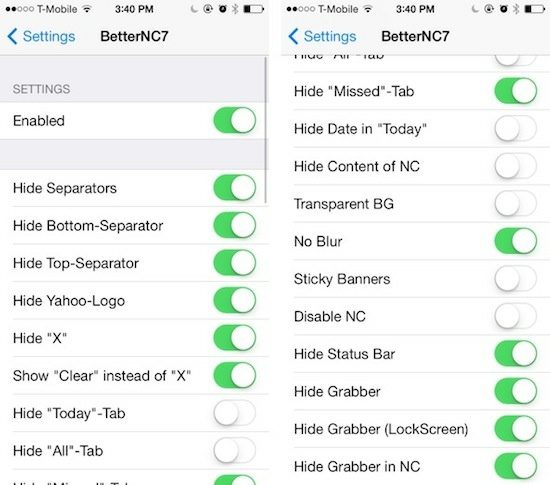 Notific8 is a brand new free cydia tweak that makes your N.C. look exactly like the new N.C. in iOS 8. The Missed Tab is gone and the All Tab is renamed as “Notifications”. There is an additional button called “Edit”, which is used in iOS 8 to adjust the widgets in the N.C. In this tweak the Edit tab is used to configure the notification center in the Settings App. It is not a functional tweak so much as it is an appearance. This jailbreak tweak is solely useful if you want to make you N.C. to look like that of an iOS 8 device. This is a free cydia tweak that adds the Share buttons of the different social networking sites to your Notification Center so that you can share your content on the go without opening or closing any other app that you are currently using. 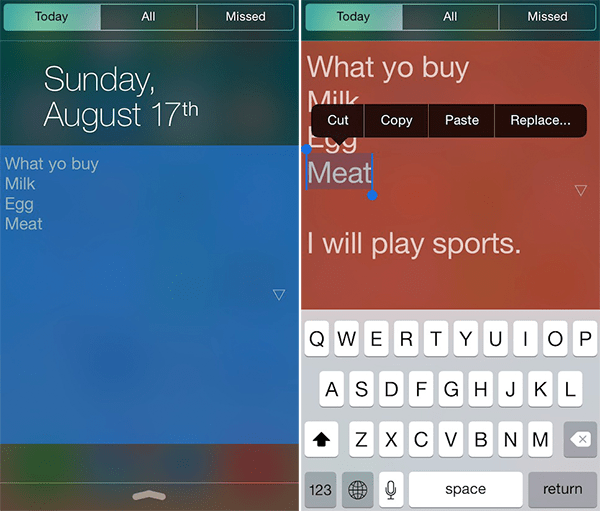 Widgets like these were present in previous iOS versions. This tweak brings them back to the NC. Facebook, Twitter, Weibo, Tencent share widgets. You can configure them in the Settings>Notification Center>Share Widget section. You can also use this from LockScreen if you are not using a password for your device. This tweak changes both your Control Center as well as your Notification Center. In the Notification Center it displays the Network Stats and System Stats such as Free Space, RAM, Network data which can be accessed from the Today tab. You can also customize the icons and change the text colors. This tweak does not function on iPads. In iOS 7 when you open the notification center it goes to the last tab you opened in the notification center. But by using this Free Cydia Tweak you can set a default Tab to open whenever you open the notification center. In the absence of any new notifications to show on your default Tab, it can be set to open Today tab. It additionally comes with three useful swipe gestures to ease your notification center experience. Swipe DOWN on Middle to open “All” tab. Swipe DOWN on extreme Left to open “Today” tab. Swipe DOWN on extreme Right to open “Missed” tab. In iOS 7 you’ll need to tap each notification twice to clear it. By using this free cydia tweak you need to tap the “X” button only once to clear the Notifications. This is tweak is available for free on cydia and is very handy especially if you get a ton of notifications all the time. Hide Contents of N.C. such as Date, Status Bar, Grabber, Grabber(LockScreen), Yahoo Logo, tabs, Bottom and Top Seperators and many more toggles to hide or show the features as you like.It also has Transparent BG (background) toggle to make the background transparent. You can also remove the blur effect and all such stuff using this free tweak. 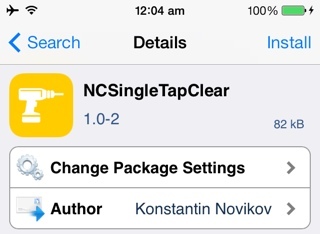 If you are going for a single Notification Center tweak then BetterNC7 is the one for you. So, these were the Best Free Cydia Tweaks for Notification Center in iOS 7 that we came up with this time. Tell us what you feel about them. Don’t forget to view our post concerning how to fix Favorite Contacts 7 for Notification Center on iOS 7.1.X. For more best free and paid cydia tweaks browse through our articles.